Arts and Crafts Vegetable Stamping Fun! Crafting with younger children can be fun. This month featured video roundup focuses on vegetable prints. Did you know it is possible to get rose shaped prints from celery? How about little flowers from okra? It is astounding how easy it is to transform fruits, vegetables, and some paint into art. Young children love fruit and vegetable stamps because they are easy, quick and fun. Although this craft is geared towards younger children, older kids will also love this tutorial! All ages are guaranteed to enjoy this creative stamping technique. The following videos instruct the basics of vegetable and fruit printing. If you are a preschool teacher or homeschooling mom, the video tutorials will help get you started. Let's get creative with our little artists! 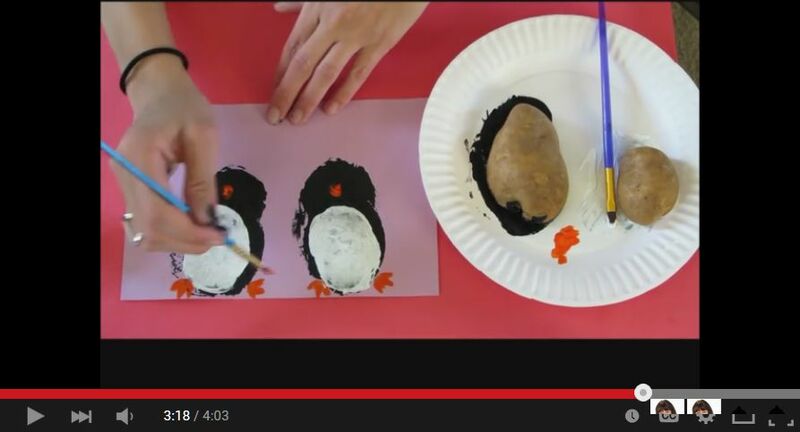 All you need to make a penguin print are some potatoes, black acrylic paint, white acrylic paint, a dab of orange paint and some googly eyes! This art project is a perfect fit for preschoolers. Make it in the winter for the Christmas season or in February for Valentine's Day. Just put a heart between two Penguins and it will be perfect for a Valentines Day card. Very Cute! Show your students how to make this beautiful watercolor vase and flower art project with this easy to follow wordless video tutorial. Who would have guessed the flowers are made from okra prints?This project would be suitable for an elementary level art class and beyond. Teachers can proudly display the finished pieces in their rooms for everyone to see! Don't forget the homeschool students! They will love this project too! Who knew that the simple vegetables celery and romaine lettuce could be used as a tool to make very lovely flower stamps? You can print a rose with the celery stalk, and print a carnation from romaine lettuce. Awesome! Joelle Meijer demonstrates how in this informative video tutorial. These prints would work well for fabric decoration as well as paper print crafts. The very creative Joelle Meijer presents yet another fun children's video tutorial. Teach your little ones how to make the cutest chicks from potato stamps. Your kids will be proud of the art created with this informative video tutorial, and the prints will make cute Easter decorations! Make some unique prints from diverse sources other than fruits and vegetables! This YouTube video shows how to paint a tranquil scene using leaves. Just follow the video to make the background and tree, then add "foliage" to the tree using leaves from the garden. These prints are quite lovely and are also fun to make! Kim Bristow demonstrates how to make a flower stamp out of a cucumber. Why not use this stamping project as a preschool card craft for Mothers Day? Kim also shows how to assemble the lovely card along with teaching the stamping techniques. This project is easy enough for small children. The teacher needs to help out only a little bit. Wouldn't Mom appreciate a statement of love from her little one? I think so! our child make them some bookmarks that have been printed with vegetable stamps? These bookmarks are quite cute! This craft is suitable for elementary-aged students. Make a sweet flower from okra, then paint the rest of the artwork by hand. Handmade bookmarks are the gift that all bibliophiles will appreciate!